I had a plan for what I would like to build this time at home, but somehow a non-scheduled project has found it way into the workshop. Actually it is a project that I have considered for some time: A new sawbench. I made a sawbench something like 8 years ago, and it is one of the most used pieces of equipment I have in the shop. A thing that I have thought would be useful was if I could use a sawbench for my dowel plates. That way I didn't have to mess around on the top of the workbench, to make sure that a hole for one of the dogs was straight below the hole in the dowel plate. Also the stretchers for the legs would be a perfect little test subject for my new chain mortiser. And with Asger and Gustav in the shop, I didn't have any room for building the staircase which meant that it was perfectly OK in my mind to start another project. The first bench I made was made exactly to the measurements outlined in Woodworking Magazine. This time I decided that it might not cause the world economy to collapse, if I decided to make a few alterations to the design. So I made the top thicker, wider and a little bit longer than on the original. I stayed with the same height, and also the same angle of splay on the legs. This time I used larch for legs and stretchers, and a piece of Sitka spruce for the top that I milled long time ago. The tenons of the stretchers are drawbored and wedged. The top is secured with dowels that I tried to drawbore as well. I did that so that the dowels will hold the top to close to the notch in the top of the legs. Below the top there are a couple of reinforcements glued and screwed to the legs. I used a chisel and a router plane to make a recess for the dowel plates. I chose not to make it the same depth as the plates, because it is easier to remove the plates when there is a bit protruding through the top like it is now. 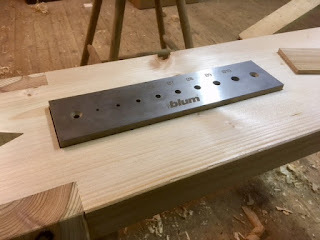 A small piece of elm was cut and planed to fit into the recess while not in use for the dowel plates. Asger working on a gambrel roofed church. Hot glue gun, strips of wood and some imagination is all it takes. I really like Asger's church building. And the sawbench isn't too shabby either. Good imagination seems to run in the family. Thanks, I like that he is hooked on building it. Never mind that he occupies the workbench, I can work whenever he is in school. The important thing is that he is having a blast. Nice saw bench, I like the idea of putting a dowel plate in the top as well. I made two much like yours (without the dowel plate :-)) that are the same height but will stack one on top of the other. Saves floor space which is at a premium in my shop. Good to see your Son working alongside you or maybe it's you working alongside your Son. Here in the States we've lost the tradition of passing skills down. Life is too busy to take the time. I really like it when my boys are in the shop with me, never mind that there is a bit of a mess, and they occupy some space. The important thing is that they like it. Asger is really impressed that your motorhome is larger than the school bus he takes to school every morning. Nice work Jonas! That's a smart idea. I would think it is preferable to mortising into your bench top, if you were planning to go that route. Nice to have a dedicated, sturdy place for that type of work. I was actually considering the bench top route. But I decided that I might regret it at some point, so a saw bench seemed like a better option. I think the bench top would have been sturdier, but the problem is that making a new workbench would be a lot more work if it didn't work out. St. Roy does something similar, and he puts a bucket under it to collect his fresh dowels. I thought about making a small drawer for the dowels, but I decided that it would be a waste of time, and a bucket is a much better option.